Today Pentecost’s stomping grounds are still the East Village, but she now focuses her formidable energies on the fate of neighborhood girls from low-income families who, as they enter adolescence, are saddled with daunting challenges that can determine the path of their entire lives. According to the 2010 census, almost 40 percent of area families live in poverty. Pentecost has long lived in the neighborhood, her adopted home from college days, having grown up in Clifton, New Jersey. While raising two boys, she noted that the neighborhood had the Boys Club of New York on 10th Street and Avenue A, a haven for local boys looking for extra school help, athletics, and mentoring. No equivalent services were provided for girls. Pentecost, who has the air of a woman who sees no obstacles—or at least none that she can’t face down—set out to fill in that gap starting in 1996 by co-founding the Lower Eastside Girls Club. Like her alma mater, the club would provide opportunities for girls to learn skills in art and science. In its first years, the club struggled to find a permanent home, and took space wherever possible—19 different locations in all, including the back of an old underwear shop and a former Catholic school. 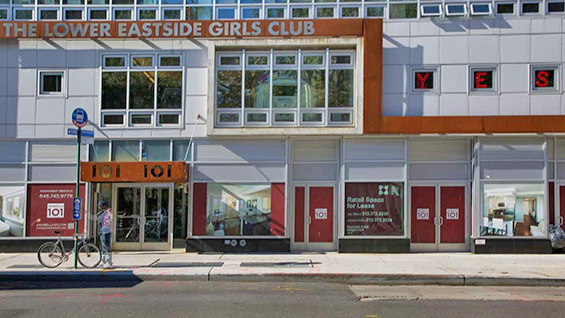 Finally in 2013, after years of fundraising, the club opened its remarkable center on Avenue D between 7th and 8th Streets, right across from public housing that the club’s literature aptly calls a “solid wall of poverty.” Today the club serves about 150 girls a day (thousands per year), and its many past homes are now memorialized in a mosaic map of the Lower East Side inside the current clubhouse. On a recent weekday, Pentecost gave a visitor a tour of the large center, which was built in 2013 on six empty lots purchased from the city. The space is covered in the art and history of the Lower East Side: one room alone has a huge sculpture by Karl Mann called “Loisaida,” the Spanglish name for the neighborhood, and a metal table that had belonged to Dorothy Day, whose Catholic Worker is located on East First Street. As Pentecost led the way through the club’s many studios and meeting rooms, she fielded questions from colleagues (they gave her updates on the visit scheduled later that day with culinary legend Alice Waters), greeted a few early arrivals, asked the chef what was being prepared for the girls, and answered phone calls about her upcoming trip to New Orleans, where some of the girls will participate in that city’s triennial of contemporary art called Prospect.4. In fact, during the month of November, Pentecost traveled to visit their sister club in Chiapas, Mexico, and to Los Angeles with some of the girls to work on a collaborative project with Las Fotos, a program that teaches teenage girls photography. After Cooper, Pentecost earned her doctorate in visual anthropology and worked as a documentarian in Chiapas, home to the country’s Zapatista movement, which arose as a response to dire conditions for residents, many of whom are indigenous. Building on her knowledge of the area, she partnered with local indigenous women to form Club Balam in Chiapas, which provides similar programs for girls and has collaborated extensively with the New York club, including exchange visits to let the girls make connections across borders. LESGC maintains partnerships with clubs in Sierra Leone, Nepal, Scotland, Hudson, NY, and New Orleans, and on the Flathead Reservation in Montana. Pentecost is notably talented at finding support for LESGC, having raised the $20 million needed to build and outfit the 33,000-square foot clubhouse. She has built a roster of patrons that includes celebrities Rosario Dawson, a member of the club’s board of directors, and Adria Petty, whose father, the late Tom Petty, contributed guitars to the club. She has also found supporters among media and financial professionals who have donated money and time to make the club’s ambitious programs a reality. Although grants from the city fund about 20 percent of the club’s budget and another 40 percent comes from foundations and corporations, individual donations make up the remaining 40 percent of the club’s finances. 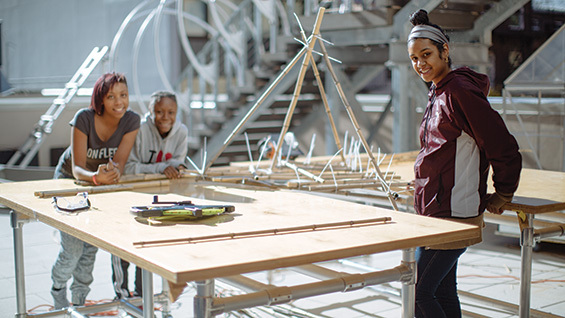 LESGC promotes experiential learning, so girls work on projects that give them knowledge of a host of skills that can be put to use in myriad ways. To make podcasts, they are trained in conducting research, asking relevant interview questions, and implementing the audio software ProTools. Their thoughtful and refreshing interviews with local political leaders, entertainers, and businesswomen can be found on the club’s website. When taking a course in photography, students learn the mechanics of picture taking—using a camera as well as image software—and are equally encouraged to use the medium to explore aspects of themselves and their community. 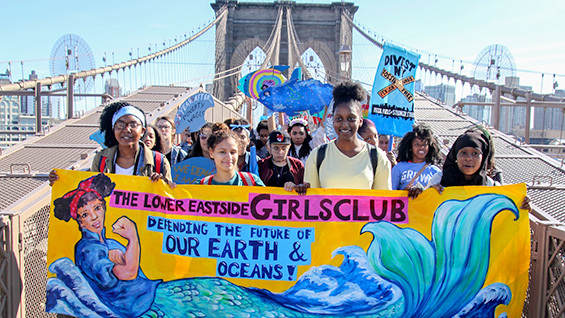 This last is central to the mission of the club, which honors local history and knowledge, respects the girls’ experience, and gives them a platform to make change, often through art. Each girl who joins the club is outfitted with a “survival kit”—an LESGC tee shirt, a USB jump drive, and a water bottle. Each item represents different aspects of the club’s overall goals for the girls: the shirt symbolizes a sense of belonging and community; the flash drive represents education; and the water bottle stands for each member’s commitment to health. It’s a logical component of girls’ education, considering that one of the central gains of the 1970s women’s movement was greater control over issues related to health. At the club, girls can study yoga, dance, and nutrition, and can participate in the running club, which meets weekly. 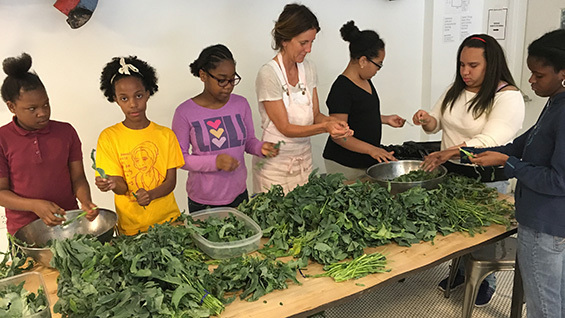 It’s led by Valerie Galindo, the club’s cooking instructor and an original member of the Lower Eastside Girls Club, who joined when she was 12 years old. She attributes much of her success to her experience with Pentecost and the club. Galindo, one of four sisters who grew up on the Lower East Side, attended the Culinary Institute of Education, where she trained as a pastry chef, all the while working at the club. The hours were long, but it was worthwhile: today she’s head of the club’s kitchen, which feeds some 150 girls a day, and teaches cooking classes both to the girls and to some of their mothers. About two years ago, she took up running, and ran her first half marathon in March 2017. Since undertaking regular exercise, Galindo has lost about 50 pounds, and trained for her first New York City marathon. She feels LESGC gave her the support and the vision she needed to control the direction of her life. “I don’t really have words to explain my feelings about Lyn,” Galindo says.